Commerical grade Tubular Solid Steel Frame 2" x 3"
2 Safety bars 11.5" x 35.5"- The Real Deal! This is a great power rack and also doubles as one of our top squat stands, that you can do bench presses, squats, pull ups/ chin ups, shoulder work, back work and arms. If you're looking for one piece of equipment for that garage gym (or your workout room), that pretty much does it all - this is it! The extra lat pull down attachment really gives you a larger set of exercises you can do at home utilizing your existing Olympic weight set. This bad boy is sturdy (square and very strong pipe safeties) and made whatever you can bring at it - period! 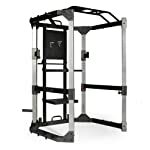 It's under the $700 range which is a great price when comparing to the commercial power racks. 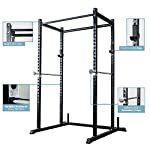 This's perfect for strength training for an intermediate to advanced athlete, looking to build out a home gym. If you can afford the price tag, won't be disappointed with it. Why Purchase a Power Rack Anyways? I'm sure you are here looking to buy a power rack (or new piece of equipment), that you can do a multitude of exercises in your home, garage gym or commercial gym. There are a lot of choices out there for strength training, so I went out and researched the most popular cages out there, by the leading fitness equipment manufactures in the industry. We will short cut your research time in half and you will narrow down the best rack you can buy for your own personal budget. What's the big deal anyways about it? Do you really need one? Well no, you can do body weight exercises all you want and not need any equipment. You want to buy one because you don't want to pay a gym membership and you want to workout at home. If you are at home you want the best bang for your buck because 90% of you will have a small space to workout in. With a power rack also called a power cage you can do ton of exercises. You can add an adjustable bench to it very easily which now gives you another whole set of exercises you can do with just about any barbell set or a set of adjustable dumbbells. Long story short, it's easily the best bang for your buck when purchasing fitness equipment for your home gym. As awesome as this is you might have saw the obvious. You will need to purchase a bench, adjustable dumbbells or standard weight set. It's really not all that of a surprise to most of us, because that was the whole purpose of wanting a power type of cage but I wanted to point that out. All of the models reviewed here, use very sturdy safety bars, as apposed to safety pins, which are not as effective at stopping an accident. Also, all of these fully replace a traditional squat stand. Of course there is space consideration as well. So make sure you have the ceiling and floor space with the rack you buy. Commercial Quality at a GREAT Price! Catches for the bar, on both the inside & outside the cage - which allows you to do squats inside or outside. I'm going to keep this straight to the point and short. As you are reading the power rack reviews below here are a few guidelines you might want to consider when picking out the best one. This will help you keep focused and not spend too much for extra features you don't need or it will be the opposite, which is to get all the extra attachments you need to complete your workouts. You might find that odd but that answer well tell you how much more money you are going to spend on setting up your gym because if you do, you will be purchasing a set of dumbbells and you want to make sure the adjustable bench fits nicely inside the power cage workout area. Every one has a pull up bar but there are some differences in the diameter of the bar and some of them have a knurling pattern on it. I mentioned that when I had the data so you would know. For the money and quality this is by far the one I would recommend to anyone who wants a commercial grade power cage at a great price. There are 2 really solid safety bars that will hold up to 1500 lbs of weight. Great for you serious guys and peace of mind for us normal folks it can handle anything! I love the adjustable dip handles that come with it. They have nice rubber gripped handles that are 20 inches long. Plenty of room to do dips or weighted dips. Up top on the rack you have a multi-grip pull up / chin up option that have 2 height positions. The bar holds up to 600lbs. Lastly, you can expand it by adding the lat-pull down attachment to do a lot more exercises with it. Rebook took extra steps with their half rack squat rack by adding a few extra features where you can do squats, dead-lifts, presses on a bench, dips and even pull-ups. It is a nice twist because it makes it perfect for a home gym where you are limited on space and you want to do all of the strength training exercises listed above vs just buying a squat rack only. Fully replaces a traditional squat stand. The unit is 52” x 59”x 87 inches and weighs in at 197 pounds. It has a weight capacity of 500 pounds. This is a very solid rack that is made of 12 and 14 steel gauge, with extra strong pipe safeties - no flimsy safety pins. The construction is put together extremely well with extra welds. The overhead bar is also welded to the frame and although no band pegs, its still great for pull-ups, chin-ups and to attach resistance bands to it. All of the ends are also caped so nobody gets scratched when buying it. This Rebook cage does support both 6 foot and 7-foot barbell bars. Installation is straightforward and the directions are not that hard to follow. I would recommend having two people to help out with the installation of the rack. Note: There are 3 adjustment options when you put this together that you can adjust the height you wanted it assembled incase you have ceiling restrictions. You can also bolt this to the floor if you want it to be really stable. This a stable half squat rack (great for squat stands) and that will work for all the normal workouts. I would suggest that if you were getting into a lot of weight you would want to keep it low on the rack or look at one of the more heavy-duty models. This also depends on the surface you have the stand on as well. It will work on the rubber puzzle mats, carpet and regular flooring. Overall the Rebook half cage is a great buy for your gym at home, or garage gym that allows you to have several extra exercise options. This is one of my favorites because of the price, extra options and it’s simplicity. 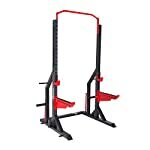 This model is what you would use in the gym but the price is way lower, but on par with a traditional squat stand, which normally has way less features. This model has a 700lb capacity, which is more than most people will every need. You can load 400 pounds on the bar for pull-ups and 400 pounds on the dip bars. The dimensions of the rep are 83” high x 48” wide and 58” in depth. So at almost 7 feet tall this can easily fit in a workout room in your house without hitting the ceiling. When you get inside the cage you are looking at 26” depth and 44” wide. The frame itself is 2x2 steel with matte black power coating. On the frame you will see numbered holes so it’s easy to line up the bar hooks/holders on each side. You will get 2 pull up bar width options up top, which one is 1.25” and the other is 2”. Also included is a dip attachment, which is a pretty sweet option. Let’s not forget about the 2 chrome safety bars that is a must. Lastly, it comes with J-hooks lined with a strong plastic. Lastly, you can easily add their adjustable bench as an option and you have one of the most affordable upgrade options you can buy to do almost all the exercises you need at home. This Rep fitness rack is a great piece of equipment that won’t break the budget. You will need 2 people to assemble it, which should take around 30 minutes to install. They do have videos on their website to help you. The directions are really good so you probably won’t need it. Powerline is definitely one of the main manufactures in the industry and their PPR200x model is one of their popular models to add to your home gym. The PPR200x has plenty of walk-in room to do squats, calf raises, shoulder shrugs, bench and even military press exercise. There are two saber style safety bars that can easily be adjusted for various exercises where you need that spotter function. The cage weights 136 pounds, which is a bit lighter than most but still offers, plenty of stability. The dimensions are 44” wide x 82” high and 46 inches in depth. This will definitely fit in you house or garage for your home gym. The rack does have 18 hole positions that you can adjust the height of the safety bars with to accommodate whatever exercise you want to do. There are optional accessories that you can purchase which are the lat attachment and adjustable weight bench. I do want to mention a few small details about the powerline PPR200x which is that the hooks are circles and not j-hooks. The other small detail you want to know is that the bar for pull-ups has a knurling pattern on it. Most people don’t mind it but you might want gloves on to do chin-ups. Also, I wanted to mention that the safety bars and lift-off rods are painted. So don’t be surprised that they get scratched when pulling them in and out of the holes. This has been a go to model for years and the reviews from many happy owners show it. 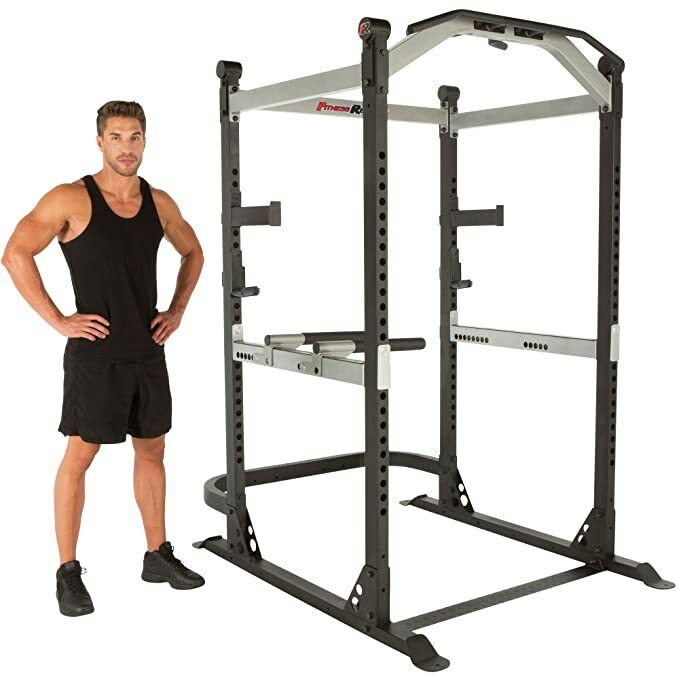 When you add in the 10-year warranty and affordable price this will make a fantastic workout cage for any home gym, or garage gym that you want to build out. It should be no surprise to anyone who has been lifting weights for any length of time that the cap barbell power racks would be on our list. The company has been producing quality equipment for decades and is absolutely one of the best in the industry. band pegs, its still great for resistance band work too. It does not have all the bells and whistles. I bought it personally because it was affordable, I wanted it for pull ups and squats. The craftsmanship and extra options show it too. The cage is all 12-14 gauge in steel with a 3 step powered coating process. The dimensions are 85" tall, 46" deep 50" wide. At 85" inches tall, know right away that you ceilings better be over that before even considering purchasing it. There is an holder for the bar on one side and olympic weight holder on the other to help keep everyting organized which keeps the foot print small for anyone having a small workout area. The Marcy power type cage is on the lower end of the price scale that most of you will love. 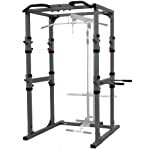 This multi-use workout cage or squat rack which is perfect to use at home, your garage gym or even in your office. 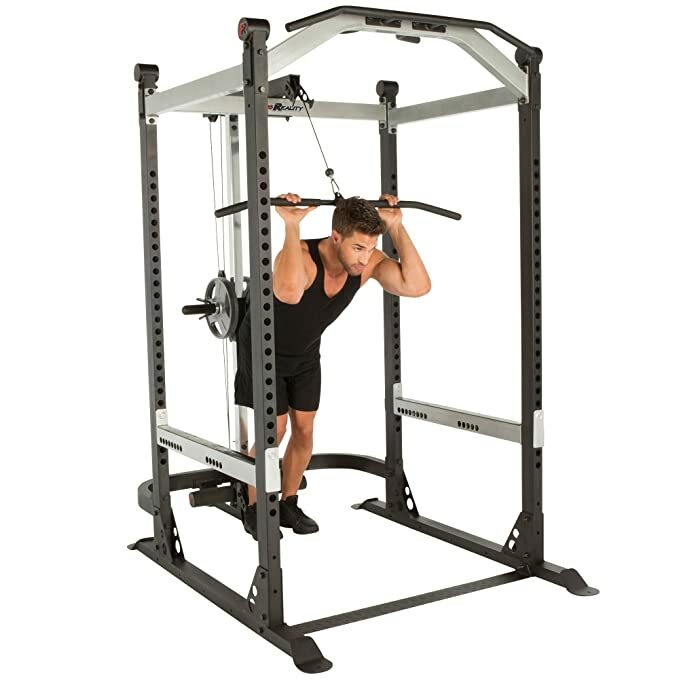 The SM-3551 Marcy cage has all the standard options you would expect but has a few unique options I love about it in this price range which is the extra storage rack options, system of pulleys to do ab work or lat pulls and a small leg attachmentyou can do a variety of exercises with. This workout cage is 86” high x 46” wide and 60” in depth, which is great for anyone with regular ceiling heights and limited space. Include on the cage is a pull-up station with 4 option grips. There is also a dip station for narrow and wide grips, which is great for working the chest muscles. The pulley system can easily be used for bicep curls, lat pull downs and any other pulley exercises you can think of. You have the standard bar catches in there that are used to hold a standard barbell for squats, shrugs for shoulder area or dead lifts. I did see that the catches could be a little short and you might want to order a 2nd pair that is longer to have a bit more room to sit the bar. You can easily store weight plates, dumbbells and kettlebells. This is a nice added bonus to help clean up your workout area so you are not tripping over anything on the floor when you are not using them. Note: Although this has extra features that most others don't, one important point you need to realize is that it is designed to do squat exercises in the front of the cage. While this is not a big deal, it could be to some who are working out a lone with a lot of weight. If that is you, you want the squat rack options that have safety bars inside of the cage and not on the outside one like this one. 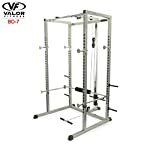 The Valor Fitness bd 7 power rack has all the basics you need with an added bonus of the Lat Pull option. It’s made of 2”x2” Steel chrome. You do have the standard 2 safety spotter bars that are great for doing squats. You will also have 4 storage pegs that you can store your Olympic plates on. There are 2 pegs on each side of the cage. The Valor BD-7 weighs 135lbs and measures 82” H x 63.5” W x 47” Deep. The inner cage actually is 39” deep and 43.5 inches wide and 80 inches tall. So, there is plenty of room to do squats, chin-ups or put an adjustable bench in there for presses. There are actually 17 adjustable positions for the bar which gives you a range of 17.5 inches all the way up to 68 inches in height. I will note that the max weight for bar holder is 500 pounds. The suggested maximum weight for pull-ups is 250lbs. Note: This is meant for standard 7-ft barbell lengths (Olympic size). This is very nice cheap power rack that won’ t break the budge giving you all the standard options while also giving you a pulley system option to do seated rows, upright rows and lat pulls. Titan Fitness produces quality gym equipment at great prices. 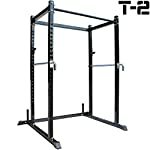 They have 2 different models to choose from which is the T2 series that is the most basic, the Titan T-3 which has extra pegs to hold the weights and the support bars are thicker. The Titan T-3 also has 2 bars ideal for pull-up, which can be used for crossfit exercise. Lastly you have the wall mount version that you can do pull-ups and squats with. With that said I’m going to give you the run down on the Titan T-2 Series sqaut rack, which is going to be what most everyone is looking for. It has a capacity of 700 lbs and the whole frame actually weights 107 lbs which is the lightest power rack review I will do in this guide. The Titan is 83” high x 48” wide and 48” deep. So, this piece of equipment really has a small footprint and will easily fit into a small workout room with plenty of ceiling clearance. It uses regular j-hook attachments to hold the bar for squats. The bar for pull-up excercises is nice and narrow at 1 ¼ “ in diameter. So you have an easy grip. You will store your weights on the bottom of the rack in back. Note: The Titan T2 does come with an attachment for dips that hooks onto each side of the frame in front. Next up is the TDS rack that is as basic as you can get and is one of the cheapest power cages we will look in this buyer’s guide. So, if you are after simplicity and solely looking for a squat rack, a pull-up option and a cage you could put a bench in later on, then this is it. 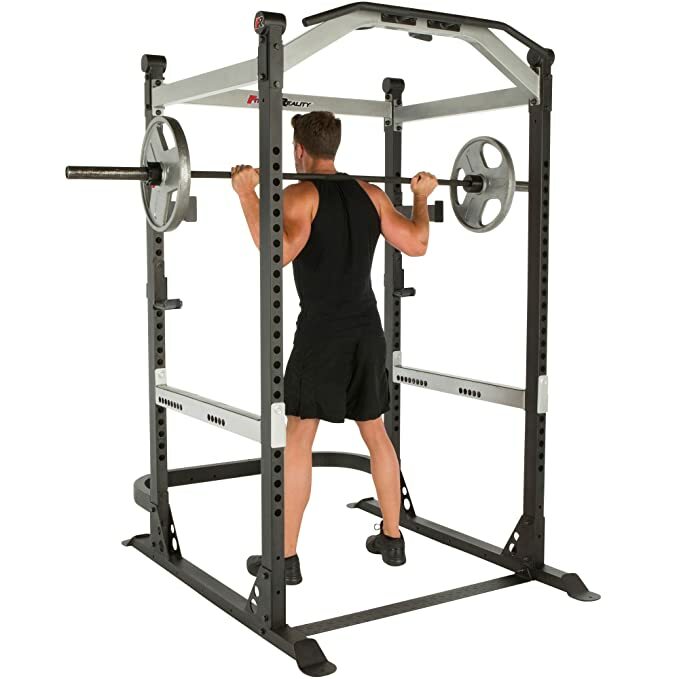 The TDS squat rack has a nice looking white coat on its solid steel frame body. The frame is 82.5” tall x 48.5” wide and 48” deep weighing in at 138 pounds. There is a knurled pull-up bar that is 1” 1/8 in diameter on the front of the cage. Also included are two safety bars that will be great spotters for heavy squats, shrugs targeting shoulders or for dead lifts. You also have the standard bar, which allow the j-hook style catches to easily be moved. You will also find 2 storage pegs for weights on the bottom of the rack, which makes it nice to store your weight. Last but not least this bad boy has a 1000lb weight capacity. Note: I did see that there is a Lat option for this that you can order separately. So, again if your looking for cheap power racks that are basic, but gets the job done, then you should consider looking at this one here. The powertec fitness rack is a free weight training machine! I wanted to mention the powertec because it is a very well made rack that has a lot of accessory options that can be added to it. The pull-up bar supports up to 400 pounds, which is more than the others I have looked at as well. The dip attachment and j-hooks both support up to 400 pounds as well. The pull-up bars are on the front and are separated to grab with each hand. It also comes with an attachment perfect for dips that fits on the side. So, you will want to have weight on the other side of the rack just to be safe when using it. It’s 84” tall x 50.6” wide x 50.8 deep inches deep. That gives you plenty of room inside the cage to exercise. and a barbell landmine attachment. XMark is no stranger to producing top rated weight lifting equipment so I wanted to make sure I mentioned their XM-7620 model. This beast is made of 11 gauge 2”x3” steel frame which is coated with a scratch resistance powder coating. Let’s talk about how this differs from other racks. The spotter bars are actually attached to the rack and slide up and down every 2 inches by pulling out a knob to move it. The spotter bars are really thick and solid. There are bar catches on the inside area of the cage and on the outside of the cage. This is a fantastic option to allow you to do squats on the inside or outside. You can also lower the catches on the outside to do shrugs (shoulder) or lift it off and do dead lifts with. NO LONGER AVAILABLE. Please see Fitness Reality here instead. There is a wide grip pull up option and a narrow chin up grips on the front. On the side of the cage you have a dip attachment to do dips with. There is an optional XM-7621 lat pull-down and row attachment that you can do rows seated with or bicep curls. So you are paying a bit more for the xmark craftsmanship and brand that has awesome add-on capabilities. You of course can add an adjustable bench on the inside of the cage to complete the set. This has to be one of the best benefits of buying one for your own home gym setup. You can do a ton of exercises with it and not have to buy a ton of exercise machines or pay for a gym membership to do it. You can easily see that when you make this purchase, you will open the door to a whole new type of set of exercises and you won't be disappointed! More than likely you are wanting to use free weights at home for your workouts. So, there are three obvious accessories that you will want to look at purchasing along with the cage. These are the standard olympic weights that you would see at a local gym or club. They are always included at the squat rack, left press machine and most free weight areas. Cap Barbell Olympic weights are the standard set to buy by far. In all honesty, this is really a pretty simple purchase to consider. You need to figure out how much weight you will need. So, anticipate how much weight you think you could squat, bench or dead-lift in your workout. From there you can just go out and find the best weight set. 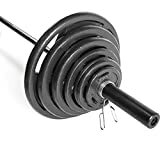 I will note that the only thing you need to look for is if you need the ones with the 2 inch or 1 inch hole to fit the barbell they will be used with. I would personally lean toward the plate that has the hand grip hole built into it as they are easier to handle. A set usually contains 300 lbs and comes with a bar which you can see the set here on amazon and pick out the type of plate you want. There are various brands to choose from and they also come in two sizes. You will find both a 6 foot and 7 foot Olympic style barbell set. The standard is 7 foot. This is really an important choice by the way. You want to make sure the rack width of the cage will support the barbell when it sits into the catches (bar), or j-hooks is another name for them. You can purchases these separately if you already have weights otherwise it comes with the set. There are a few things to note about which one to pick. The length is important so it fits the weight plate holes and sits in the power rack. You will want to know the weight capacity of the bar. More important for power lifters or crossfiters who do a lot of weight. Here is a brief selection below to help you get started. You will want some way to secure the plates on the bar. You can go really simple and cheap here. If you buy a set they usually come with the solid steel spring clamps that I'm sure you all have seen in the gym or used. There are fancier Weight Collars that you can purchase that lock on better and just look manly! They would only be necessary for those of you who will be pushing a lot of weight and you cannot afford to have the weights moving around. Last but not least you will want a bench that will fit inside of the workout cage. So make sure to check the dimensions so you have plenty of room in there. You want to be conscious of how low or high you can go with the spotter bars if you are going to be benching alone and need them. You also want to make sure your bench will fit for incline press and that the bar sits in the right position on the j-hooks to do incline press. I have a nice long review on these type of benches you can read. Most of the racks on this page actually have the option to buy the bench with it and definitely make their own brand of benches to work with each model. The video below is what I'm taking about using the spotter bars for pressing from your incline or decline bench. Now that you have a really nice list to start with it is up to you to find the best power rack that will work for your setup. Decide what price range you want to land in, ask yourself do you need the extra attachments for dip and lat pulls. The yes or no answer to that should land you at the right one. If you have any questions please leave them below.